When the Michigan Department of Civil Rights asked the U.S. Department of Education to end the use of American Indian mascots, we expected that many people’s first reaction would be to defend the traditions they represent. Pride runs deep in our state and nowhere is that pride more evident than in our local public schools. But people who’ve gotten past their initial reaction and read our supporting argument know that we are not saying that every school with an American Indian mascot should be ashamed of it. (Read it.) In fact, we acknowledge that the opposite is true. Mascots were often chosen with the intent of paying tribute to American Indians, providing a unifying symbol under all could gather in shared spirit. But good intentions only go so far. New studies establish that harm is caused to students even when the mascots are limited only to positive images. These harms include decreased academic performance and lower feelings of self-esteem, self-worth and achievement. When we know an action (or in this case, a symbol) causes harm to the very students we are called upon to protect and nurture, change is needed. Dan Levy is the chief legal officer of the Michigan Department of Civil Rights (www.michigan.gov/mdcr). We believe schools that recognize this new body of research and act in the interests of students can always be proud of their mascots -- past, present and future. We also believe that if a school insists on keeping its mascot after discovering doing so harms students, it is that school and not this department who tarnishes the mascot. Many have questioned why we took our complaint to the federal government. We view this as the next step in a conversation that started decades ago. In 1988, the Michigan Civil Rights Commission issued a report calling for an end to American Indian mascots; then passed a similar resolution in 2002. The State Board of Education did likewise in 2003, 2006 and 2010. Asking for the creation of a national standard allows the decision to be made by experts, removed from the community strife these discussions cause. We seek a remedy that acknowledges the information requiring change is new, and thus does not order schools to change everything overnight. We would like to see name changes as soon as possible, but gym floors and various uniforms changed only when otherwise replaced. What about the Fighting Irish, others ask? First, the schools Irish founders chose the name and non-Irish fans don’t wear Irish face-paint and costumes to "play" Irish. Additionally, whereas images of Irish people are not presented everywhere, from sports to television and movies, as a singular savage/warrior stereotype, limited depiction of American Indians as anything other than mascots gives inordinate power to those images. But most important, America never paid bounties for the scalps of dead Irishmen (yes we scalped the Indians, it’s where the term “Redskins” comes from); we did not round the Irish up for forced death marches; we did not make the Irish sign treaties we’ve failed to honor; and schools using an Irish mascot are not built on land forcibly taken from the Irish people who once called it home. Okemos Chieftains are not on your list there, but they are definitely based on Chief Okemos. The schools you see there are the ones in a list filed by MDCR with the federal government; Bridge simply replicated the list from the documents provided by MDCR. This is such a load of crap I can't believe it! Maybe we should all stop using the tribal run casinos, because we all know they are very bad for a persons economic and psychological health! When will this nonsense stop! The State has more important crisis to address then this! Yes, I agree. What a load of crap! What will they think of next!!! Obviously Mr.Levy sees only an demeaning side to mascots. When I was younger mascots were imbued with values that we were encouraged to emulate, it was a loyalty such as a tribe member has to the tribe, a strength of character in the face of difficulty such as one would face in the wilderness, etc. If my history lessons were correct the native American tribes used personal mascots to glorify the traits they want in themselves and their tribe members. Mr. Levy can only see one side, he cannot see the other. The Chippawa's seem to embody a self reliance, a personal strength, a loyalty to the tribe that I see being communicate when they are held up to a student body as the mascot for their school. Mr. Levy sees that mascots are only a cartoon character for derision, I see mascots a symbol or brand of personal values and team strength in times of stress and as point of pride. Why do we name schools, isn't it for sa means to recognize and encourage the emulation of people we admire? Why is Mr. Levy so quick to think that a school would select a mascot to be demeaned. For if I am to have pride in where I was a student, where I was a member of a team, why proudly claim the school mascot as my own with pride if it were only for demeaning others. Mr. Levy can only see things through one lense, that of how he would demean people. I look at things through many lenses and look to the why something is heralded. Mr. Levy ignores the context of the times and holds everything to his standards as if he has a suprior intellect that all others, espcially those with a differring view, can't possess. I am suprise Mr. Levy hasn't taken on the American nick name of 'Yankee' for it was create as a derogitory remark. Or the American mascot of 'Uncle Sam' since it depicts a white hair man in striped pants. If a tribe of native Americans is comfortable and confident how they are portrayed with a school using them a mascot, how it that Mr. Levy knows better then they. I wonder if maybe Mr. Levy wants schools to start replacing their mascot with those of State agencies such as the Michigan Dept of Civil Rights. After reading Mr. Levy's article it is clear that would be the embodiment of traits we want the students to have when they face personal challenges on the athletic field, on the academic field, in their personal lives. Listen to Mr. Levy, look at mascots as only demeaning not as a point of pride nor as an icon of strong personal traits, don;t think for yourself just let Mr Levy and the Dept of Civil Rights tell you how to think, don;t look at an artists rendering of an Indian as representing personal strength, of individual skills, of personal loyalty. Mr. Levy is tell us that an artist simplified drawing of an Indian is not noble it is only to be seen as derogatory. Don;t listen to what a Michgian Tribe says about their pride in being a mascot, only listen to Mr. Levy. My ethics and morals I have learned in harder places than I suspect Mr. Levy has ever seen and yet he believes he and his fellow Dept of Civil Rights has higher standards than I. I remeber an ad for environmental caring when an American Indian was used as the icon for that caring, I wonder if Mr. Levy would condemn such usage, because for a while is was an equivalent of a mascot for that cause. I now better understand what purpose the Michigan Dept of Civil Rights has, it is less about the actual violation of laws and it is about the preception/mispreception that they have of what others might see in a symbol/mascot/icon/ and creating new laws to control people possible thoughts.. I believe that many of us are afflicted with "White Man's Guilt." There is no question that as America was settled, we did Native Americans no favors. However, the answer is not to wipe all memory of them off the map - the answer is to use some common sense when reviewing the issue of mascots. 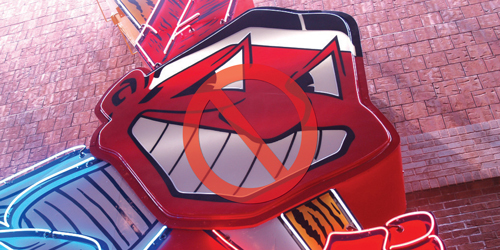 No question that the Cleveland Indians' Chief Wahoo should be examined, no doubt that the Washington Redskins should be similarly reviewed. However, to say that the name of a tribe is hurtful is ridiculous - instead, the name honors that tribe. If we fail to remember, we forget. Case in point, EMU removed the name "Huron." Should we also change the name of Lake Huron, or change street names in Ann Arbor and elsewhere that use the name of the tribe? Does not the name "Chippewa" at CMU evoke pride when it's spoken? Even the use of the terms Warriors, Chiefs and the like connote honor to brave Native Americans who fought for their land and their tribes. Let's not seek to forget - let's seek to remember! Sounds like "white people problems" to me. Only in America would some government group take the time and effort to eradicate such a blight on the social fabric. I guess all the other problems are pretty much fixed. Somehow, they don't have an issue with Quakers (Lansing Eastern) or Vikings (all over the place) or Fighting Irish (all Catholic schools I would guess) or even the Eskimos (some school up north)... aren't there some Norsemen as well? Let's ban humans as mascots. Not just the non white ones. And the ones from the past too, Spartans and Trojans.. those have to go. Of course the PETA people will be outraged with the naming of the Okemos "French Poodles" or the Sexton "Pit Bulls" as demeaning to canines. Lansing Catholic Central Cougars? Where will the outrage stop? Studies have shown that misguided government bureaucrats will stop at nothing to impose their job security needs on something as trivial as this. Your governmental ancestry thought it was a good idea to basically try to eliminate the Indian way of life from America. You pretty much succeeded in that one.. this is nothing more than the final mission. I will say this.. I have a really old Okemos baseball flannel from my days as a ball player and the Indian on the jersey is pretty demeaning. I can see that one, no doubt. But that was 40 years ago.. and they don't have that logo any longer. "In God we trust, all others bring data" Please Mr. Levy bring data to support your statement "New studies establish that harm is caused to students..." I am proud of my Native American background and am unaware of being "harmed" - numbers please, not empirical evidence. Sadly the "studies" you referred to gave no evidence. I found it interesting that your "New studies" is simply a review of Wisconsin's "Indian (I thought Native American was the PC term?) Mascot Law. It appeared from the article that at least one circuit court found: "...that the statute 'is an uncommonly silly law,...'" This review should be sufficient to convince MDCR that their efforts will be of a much greater benefit to all of the people of MI spent elsewhere. Sorry, but this is another load of crap spewing "research" but not citing anything reputable.